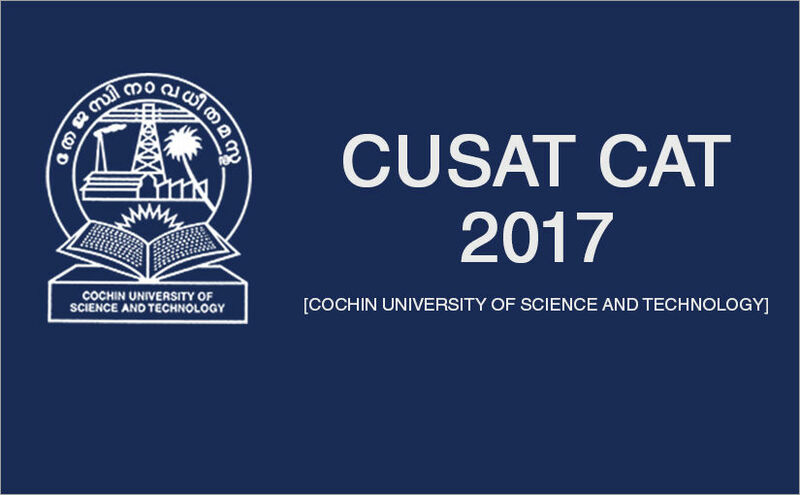 CUSAT CAT 2017 Is conducted by the Cochin University of Science and Technology. This exam is the gateway for admissions to all UG and PG programs except M.Phil, Ph.D and Diploma Program at the Cochin University of Science and Technology. For MBA the score of CMAT (AICTE) or KMAT (Kerala) or CAT (IIT) is compulsory. Get here full details of CUSAT CAT 2017 including admission announcement, application form, admit card, results. Latest: CUSAT CAT 2017 Rank List for various courses have been released. Check it through the result link below. Interested candidates who satisfy eligibility criteria can apply through CUSAT CAT 2017 Application Form until the last date for which you can take a look at the schedule or important dates here. Common Admission Test 2017 (CAT-2017) will be Conducted in Online Mode only. Schedule for CUSAT CAT 2017 is given below. Each candidate must fill in and submit application form for the purpose of taking admission in CUSAT. Mention correct information about the name, address, educational qualification and all other information that the application form asks for. Pay required fee and submit online application form on or before the last date. Make sure that form submits. CUSAT CAT 2017 Online Registration is the first major event in CUSAT Common Admission Test events. CUSAT makes available CUSAT 2017 Application Form in online mode only. You can do online registration from 8th February 2017 until window closes. It is a process with few steps. First of all register with basic details. Once account creates on the official website for registration then the system sends log in credentials to registered email ID / sms. For the purpose of completing form now you can log in and enter all other details, and also upload images. The final step in form filling is to pay fees. Check application fee amount and pay it in available mode. Print confirmation page or final filled in application form and keep it safely for future reference. After the candidate registration for exam they will get the credentials required to download the Admit Card of CUSAT CAT 2017. The CUSAT CAT Admit Card 2017 is essentially the document that authorizes candidates to appear in the exam. Only a candidate with the hall ticket gets entry in the exam hall. Candidate should download it before the exam date. result to know marks, and All India Rank. Post exam, the first main event related to CUSAT Common Admission Test 2017 could be the release of CUSAT CAT 2017 Answer Keys. It is likely that the University will release keys a few weeks after exam. Irrespective of whether keys get issued or not, result of CUSAT 2017 will be available online most probably within a month of the exam. Candidates can check CUSAT CAT Result 2017 online through login. For more details of CUSAT CAT 2017 – Download Information Brochure. If you have any queries regarding CUSAT CAT 2017, please ask in the comments below.